Mike Nelson is a clutterer. And so are thousands of other Americans. According to Nelson, clutter isnt just a minor annoyance or an organizational challenge. It can destroy self esteem and relationships, contribute to financial problems, and even lead to unemployment. In fact, studies have shown that clutterers are also overeaters, alcoholics, and chronic debtors. For Nelson, clutter became his identityhis all-consuming passion. 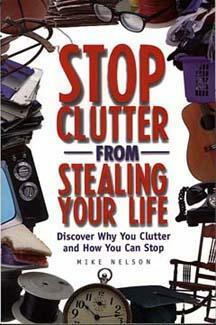 This book is the story of Mike Nelsons journey from the depths of cluttered despair to a new clutter-free life. A former writer of travel guides, Nelson now guides his troubled readers on a sojourn of another sortone out of the habit of cluttering into a carefree, clutter-free life. He begins by telling his readers to start with their most obvious source of clutter in their life so that they can obtain immediate gratification. By experiencing the success of ridding themselves of some of their clutter, theyll have the will power to continue. He stresses beginning with projects that can easily be accomplished. Momentos, most of which are too hard to part with, are best left for later on when the clutterer has some experience with uncluttering. Nelson relates tales of other clutterersSamantha, Mary, Marilyn, Richard, Joe and others. Each has an intriguing story to tell. Some, like Samantha, have been fighting clutter for years. Others, like Mary, have never admitted their cluttering addiction to anyone. From his own personal experience, Nelson discusses what recovery feels like, including practical steps to help eliminate the piles of clutter. But the hardest part, as with so many other addictions, is keeping clutter at bay. He tells of reaching a new level of recovery while writing this book. After discussing, spiritualizing, and agonizing about clutter, Mike Nelson discusses professional organizers and their role in the uncluttering process. For those with the means, the help of a professional organizer may be just the ticket to get them started on their road to uncluttering. But most readers wont be able to afford one of these specialists. Instead, theyll have to plod through every drawer, read ever piece of paper, and sort through every pile to get themselves on the road to recovery. Written in a witty manner, this book is a must for anyone caught in the web of clutter. And just like a spider in a web, clutter will poison its prey and devour it for dinner.